Ai Weiwei. Law of the Journey, 2017. Reinforced PVC with aluminium frame. 60 x 6 x 3 . Presentation at the 21st Biennale of Sydney was made possible with generous support from the Sherman Foundation. Installation view of the 21st Biennale of Sydney (2018) at Cockatoo Island. Photograph: Document Photography. Courtesy the artist and neugerriemschneider, Berlin. Ai Wei Wei’s epic and harrowing documentary Human Flow (2017) exposes the staggering scale of the refugee crisis with displaced people comprising 65 million refugees worldwide. Screened as part of the 21st Biennale of Sydney, SUPERPOSITION: Equilibrium & Engagement, curated by the first curator from Asia, Mami Kataoka, the film documents with searing cinematography the experiences and conditions faced by an unprecedented number of people who have been forcibly exiled from their homes. During two years of filming, Ai Wei Wei travelled to 23 nations and 40 refugee camps resulting in this traumatic tale of hazardous ocean crossings, isolated camps and barbed-wire borders. The Biennale of Sydney has extended its borders to include activism by addressing one of the most urgent issues of our times: the perilous plight of refugees. My curatorial practice is grounded in collegiality and inclusivity as well as the importance of bringing artists and professionals to the academy as provocateurs and interlocutors, expanding the boundaries of art, artists and creatives who have sought to engage with an increasingly pluralistic environment. 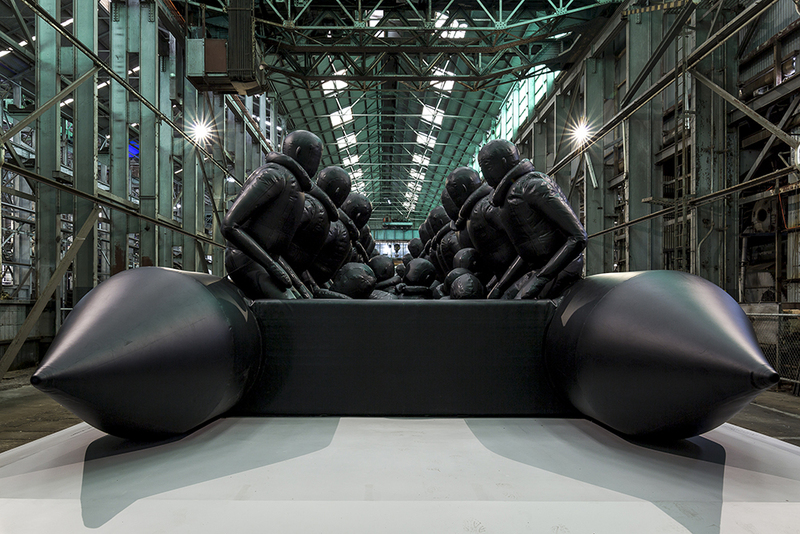 Alongside the film screening, Ai Wei Wei presented a gigantic inflatable sculptural raft, Law of the journey (2017) in the cavernous Turbine Hall of Cockatoo Island. This eerie island is a unique example of convict transportation, imprisonment and confinement (as well as a reformatory for delinquent girls and orphans) and therefore a fitting site for a monumental installation. A sixty-metre-long black rubber raft occupied by 258 refugee figures was fabricated in China in a factory that also manufactures the precarious vessels used by thousands of refugees attempting to cross the Mediterranean Sea: ‘There’s no refugee crisis, only a human crisis'. The bulky weight of the raft sits on a base inscribed with poetic aphorisms by Franz Kafka and Arnold Zable as well as other philosophers and writers throughout the ages. The currency of large scale biennales takes the creative pulse of our times. I was delighted to augment the vernissage by developing a partnership between Biennale of Sydney and Victorian College of the Arts, University of Melbourne by bringing artists Tiffany Chung (Vietnam/USA), N.S.Harsha (India) and curator David Elliott (UK/China) to Melbourne for a public event, masterclass and student-faculty encounters. It is this opportunity for affiliation and outward alliance that I hope to bring to my new role as Enterprise Professor. My curatorial practice is grounded in collegiality and inclusivity as well as the importance of bringing artists and professionals to the academy as provocateurs and interlocutors, expanding the boundaries of art, artists and creatives who have sought to engage with an increasingly pluralistic environment: teaching, curating and understanding of art and visual culture in the expanded realm. Tracey Moffatt: My Horizon, curated by Natalie King, 57th Venice Biennale 2017. At 6:30am on 15 December 2010, a boat carrying around ninety asylum seekers, mostly from Iraq and Iran, sank off the coast of Australian territory of Christmas Island in the Indian Ocean. Contemporary artist Tracey Moffatt recalls the harrowing, profound saga of devastation while watching this tragedy unfold on television. This imagery resided in Moffatt’s memory bank and was transformed into a 3-minute film, Vigil as part of Tracey Moffatt: My Horizon for the 57th Venice Biennale. I was fortunate to curate the first solo exhibition by an Indigenous artist in the Australian Pavilion at one of the most coveted events on the international arena. Tracey and I placed this hypnotic montage on large screens embedded on the pavilion’s façade ensuring immediate audience engagement amidst the throng of visitors to the Venice Biennale. Moffatt reimagines the grim plight of refugees, desperate journeys of dispossession. The watchful unease and transgression of looking is depicted in stills of white movie stars gazing – Elizabeth Taylor, Donald Sutherland, Audrey Hepburn and Cary Grant – through windows at the Christmas Island refugee tragedy via splicing and montage. Moffatt’s filmic riffs, terrorised stills of white, Hollywood characters peering through binoculars is interspersed with footage of the plight of refugees. A cinephile, Moffatt grew up in Brisbane and as a teenager made 8mm home movies of her family, sent by self-addressed envelope to Kodak for developing: her predilection to film and spinning a yarn was evident from a young age. Moffatt and Ai Wei Wei attest to the urgency of art as a vital mode of engagement and the impact of creativity in tracing and expanding our imaginary and actual borders. Despite the precarity of the creative sector, artworks can allow us to voyage with intellectual and imaginary agility to unknown destinations. Tracey Moffatt’s stories rendered in photography and video highlight how we live in a tumultuous era of displacement and upheaval. We are reminded of mass human movement across borders and terrain: the timeless narrative of forced migration. Moffatt and Ai Wei Wei attest to the urgency of art as a vital mode of engagement and the impact of creativity in tracing and expanding our imaginary and actual borders. Despite the precarity of the creative sector, artworks can allow us to voyage with intellectual and imaginary agility to unknown destinations. Natalie King is Enterprise Professorial Fellow at the Victorian College of the Arts, University of Melbourne. She is an Australian curator and arts leader with more than two decades experience in international contemporary art realising landmark projects in Italy, India, Indonesia, Japan, Korea, Singapore, Taiwan and Vietnam. In 2017, she was Curator of Tracey Moffatt: My Horizon, Australian Pavilion at Venice Biennale, accompanied by a publication that she edited with Thames & Hudson. Natalie is widely published in arts media including Flash Art International, Art and Australia and the ABC. She is a Member of the International Association of Art Critics, Paris.